*Please note the change in Heavy Wall thickness, from .090” to .096”. Fiberglass Opti-Com® comes in 20-foot overall lengths with a 60-inch Integral bell end on one end and matching inner and outer duct spigots on the other end. Standard fiberglass outer duct color is black. 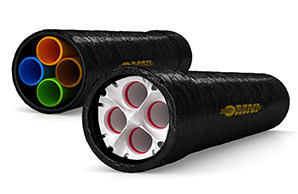 Fiberglass outer ducts can be manufactured in other colors, such as orange, to identify fiber optic cables.